So what does Gordon Brown do - now he's bottled getting an elected mandate from anyone ? Well its to use the machine of government to try to achieve narrow party advantage. 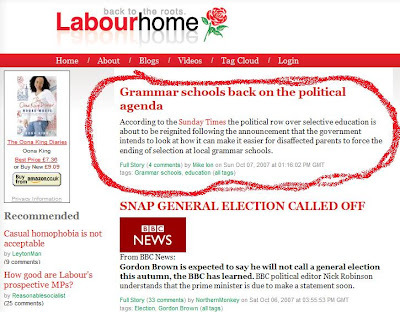 Grammar Schools back on the political agenda. Knight’s move will be seen as an attempt partly to appease the Labour left and partly as a ploy to reopen a split in the Tory party over selection that emerged this summer. David Willetts, then shadow education secretary, said the 11-plus exam “entrenches advantage”. So here we see government ministers spending their time thinking about political campaigning, not doing the job we pay them a very large amount of money to do . Its a blatant attempt to change the media's agenda to try and gain party advantage, rather than doing their job. Gordon's back - running the country for his own personal benefit. Maybe he helps organise some of this on the private mobile phone he has insisted on having. ( Which in itself raises great questions about the leader of the country being under external influences that no one in the civil service may know about. ) What does he need such a phone for - except to have conversations a record of which would reflect badly upon him ? Labour are beneath contempt. An opinion that is at long last beginning to spread across the country. I wonder how Cameron would respond to that. He has to come up with something more concrete that just complaining that the grammar school debate is pointless. How is he going to improve educational opportunities for everyone? I would answer it by saying that the underlying issue is setting. That the few Grammar schools that remain are useful in terms that they show what should be achievable for pupils of equivalent talent at all state schools ! The reason that the left wants to kill of grammar schools is that they make clear the failure of comprehensive state education. I think David Cameron is right to back the academies - especially as they are really a Conservative idea that it took Tony Blair 10 years to realise was a good one. There are no grammar schools near my home, and I wouldn't want one. But I would like real academic discipline, proper teaching of science ( not the dumbed down idiots guide Labour have allowed to emerge ), and a strong ethos. That's where I would like to send my children, and apparently so does David Cameron with his.